Edelbrock AVS2 Series 650 CFM Carburetor with Electric Choke. 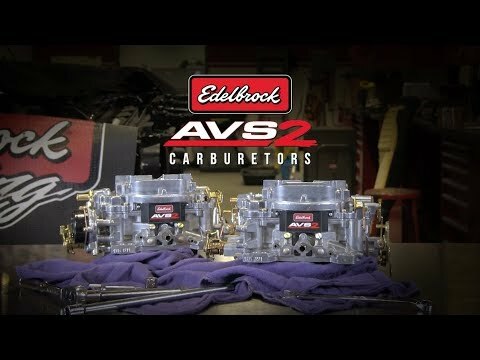 The AVS2 Series is the next generation in Edelbrock carburetors! Featuring annular primary boosters for improved off idle and cruising performance. The improved flow metering makes this carburetor ideal for use with a wide variety of small-block and big-block engines with either dual- or single-plane intake manifolds. The AVS2 includes both timed and full vacuum ports for ignition advance. WHY IS AN ANNULAR BOOSTER BETTER? Typical downleg boosters simply provide fuel down the center of the venturi. Annular boosters feature eight equally spaced smaller holes for better fuel atomization. That eliminates flat spots when the carb transitions from idle to part throttle for better low rpm performance. The annular boosters can also potentially offer improved mileage in some applications. Metering Jets - Primary .101", Secondary .098"
Metering Rods - .070" x .037"
Match with an Edelbrock intake manifold for the ultimate induction upgrade! A really nice performing Edelbrock carburetor.